Dr. Bhushan Nariani is a trusted Orthopedist in Vasant Kunj, Delhi. 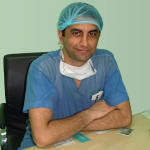 He is currently associated with Indian Spinal Injuries Center in Vasant Kunj, Delhi. Don’t wait in a queue, book an instant appointment online with Dr. Bhushan Nariani on Lybrate.com. Excellent .. I can say there is no any option of Dr Bhusan Nariani in india. He is the best so far that I know . What is spinal stenosis: The narrowing of the gaps in the spine or the backbone is called as spinal stenosis. This leads to pressure on the nerves and the spinal cord. 5% of cases of spinal stenosis are seen in the low back of the lumbar spine. In some cases, the narrowing of the spine leads to the compressing of the nerve root, which leads to pain in the leg. Symptoms of spinal stenosis: There is a constant pain in the back and legs as stenosis pinches the nerve responsible for sensation and muscle power. Other symptoms are numbness and tingling in the legs, frequent falling and pain while walking. A routine program with exercises and physical therapy are the best treatment for spinal stenosis. The exercises are not a complete cure but they are beneficial in keeping the patient active. A physical therapy can be supervised and once the period of the same is over people easily transition to the exercise program. The key for exercise is starting slowly in order to build strength. Generally, the patients are counseled not to perform strenuous activities as that might worsen the symptoms of spinal stenosis. In case of lumbar stenosis, patients find it comfortable when they are flexed forward. The doctor might recommend walking while being bent over and leaning when using a walker if not walking upright; sitting in recliners is also recommended instead of straight back chairs. Injections of cortisone are usually given in the epidural space. This is believed to relieve the symptoms of spinal stenosis temporarily. Though there have been studies which question the use of these injections as they lead to the risk of osteoporosis-related fractures. This is still being pondered over by the doctors as a suitable treatment option as it has its own benefits and risks. Medications such as the anti-inflammatory medicines like ibuprofen or aspirin are helpful in controlling the symptoms of spinal stenosis. Narcotic drugs might also prove to be helpful if used with care and for a short while. This is helpful for severe pain related to the nerves. Muscle relaxants like gabapentins might also be recommended. In some cases, antidepressants might also be given to provide relief from pain. Though side effects are a concern when using these medications and the patient should let the doctor knows about their allergies. If you wish to discuss about any specific problem, you can consult an orthopedist. What is back pain and How can we prevent back pain is the pain very dangerous for human being? according your age posture correction must. stretching exercises of spine. hot fermentation avoid strain full activity like heavy weight and toward bending. My uncle has been suffering from a severe back pain since a month. He is about 35 of age. What shall he do to recover? Hi I can understand your problem. 1 relax & stay positive. 2 take hot and cold fomentation. 3 change sleeping position. 4 use lumber support. There are various non surgical treatment options for back pain according to your health and severity of symptoms. Kindly reply in private consultation to discuss detailed treatment plan. Wishing you a good health. I have a desk job b may back is paining now very strongly. What should I do now if my back is paining in such a way? Do learn stretching and strengthening exercises from neuro physiotherapist apply hot water fomentation thrice a day for 6 days regularly do revert back for further assistance best wishes. My leg got swollen all of a sudden and there us pain and I am unable to walk. What should I do. What can be the reason. For pain take tablet paracetamol 650 mg and it could be due to a local involvement of the joint and which can be confirmed after examination. चिकित्सक साथियों से निवेदन है कि यदि उपरोक्त प्रक्रिया बारे में कुछ और जानना चाहे तो Lybrate के माध्यम से सम्पर्क कर सकते हैं। रोगियो से निवेदन है कि किसी अनुभवी आयुर्वेद विशेषज्ञ से संपर्क कर इस शीघ्र परिणामदायी चिकित्सा का लाभ लें ! Hi you should go to a nearby Gastroenterologist and get yourself checked thoroughly. It could be peptic or gastric ulcers or oesophageal varices which are a result of chronic drinking. I have back pain from last 2 years. I have showed Doctor in Kolkata two times. One time Orthopedics and another time Neuro professor. So, how can relieve from that. I noticed of late in the late evenings I get a sensation of pain/pressure in a spot just below my rib cage in the centre. I do not suffer from any ailments otherwise except for a skin problem on the feet. Hi thanks for your query and welcome to lybrate. I am Dr. Akshay from fortis hospital, new delhi. It may not actually be linked to orthopaedic issues in any way and if it is below your rib in centre, a general surgeon or a gastroenterologist will be the right doctor to seek opinion for this. Do not hesitate to contact me if you need any further assistance. I want to know about exercises being done in case of diffuse disc bulge at l1-l2 level indenting anterior the cal sac mildly with bilateral mild neural foraminal narrowing. If pain is there no exercise indicated, after relief mild passive exercises, lumber exercise, lumbo-sacral exercise, mild lumber extension exercise; click on private quastion in my name for any clarification.